Spring and good weather comes with the growing desire to show off firm, toned legs. But today’s sedentary lifestyle marked by stress and a less-than-ideal diet can make it harder to achieve optimum results on these body parts, which are so important to many women. For best results, mesoestetic proposes highly effective salon treatments combining bodyshock products and exclusive massage techniques with specific protocols with Genesis, the pharmaceutical company’s revolutionary medical-aesthetic device. And to optimise and extend the results of these professional sessions, the company offers at-home solutions from the bodyshock range to complement the treatment. mesoestetic products and treatments have the backing of over 30 years of experience in aesthetic medicine and dermocosmetics. Solutions that are 100% compatible and adaptable, allowing the design of professional sessions tailored to the characteristics and day-to-day needs of each individual patient. For the treatment of legs and glutes, mesoestetic recommends 10 salon sessions spread over 5 weeks (2 sessions per week) for optimum results. The sessions begin with tissue stimulation by gentle exfoliation and massage to help with drainage and boost the penetration of the active ingredients in the treatment area. They then focus on incorporating the potency of the active ingredients designed for the treatment with lipolytic and toning properties, all combined with exclusive massage techniques specifically created to optimise the results. Over the course of the treatment, the professional can boost the effectiveness even further by introducing Genesis. 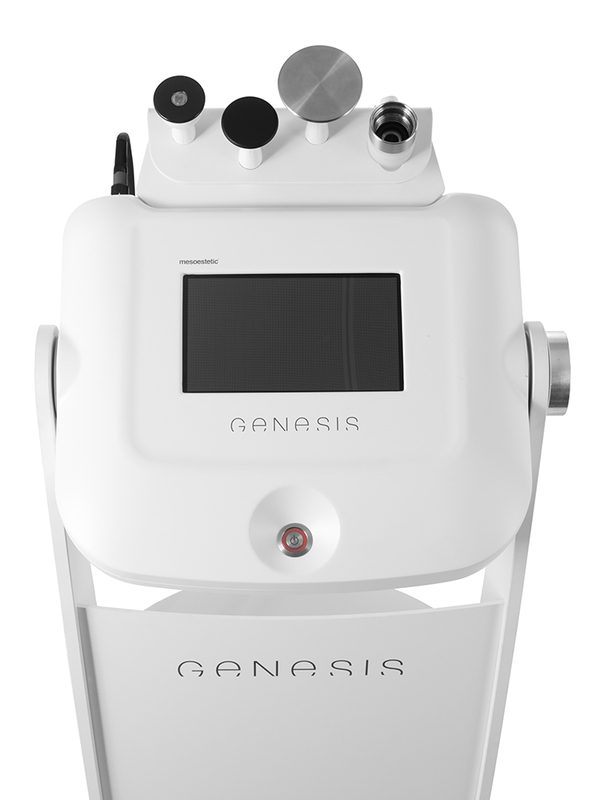 With the combined action of 4 technologies (Capacitive RF, Capacitive RF with LED, Resistive RF and Smart Transcutaneous Drive) and the pharmacological effect of the exclusive Genesis boosters, the professional can greatly intensify the results of the treatment and offer patients a very pleasurable and relaxing session. In these cases, mesoestetic recommends working with G4 Push-up & Lift, which incorporates a high concentration of active ingredients to provide a firming, lipolytic and draining action. In addition to specific techniques to sculpt and tone the legs and glutes, the beautician can complement sessions with a specific stretch mark or postpartum treatment with the new bodyshock stretchmarks booster, the latest addition to the bodyshock professional line which has proven to produce visible results from the very first session. Lastly, to maintain and boost the salon effects, the patient can follow the treatment at home with bodyshock reduce & go, the revolutionary spray for stubborn cellulite that has been especially created to eliminate localised fat on the abdomen, thighs and flanks. In its pursuit of maximum efficacy and excellence as a way to retain patients’ loyalty, mesoestetic once again evidences its commitment to beauty professionals by putting all of its experience and broad portfolio of products and techniques at their fingertips. The solutions can be combined in the salon, together with the leading technology of Genesis and at-home treatments, which work in synergy to improve skin quality and sculpt body contours.